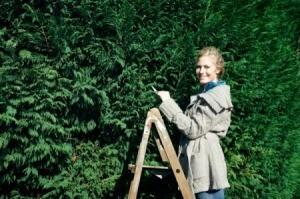 Ladders are frequently used by gardeners and homeowners for other outdoor maintenance activities. To maximize your safety choose the best type of ladder for the task and then follow the instructions for how to use it safely. This is a guide about ladder safety for gardeners. A recent accident in my community (and the resulting fatality) caused me to think about how something as common as an extension ladder could be both useful and dangerous at the same time. As gardeners, we use ladders for a lot of different tasks: picking fruit, trimming hedges, hanging birdhouses, cleaning rain gutters, and accessing items stowed in the rafters of our garage. But how many of us have taken the time to educate ourselves on the basics of ladder safety? Step Ladders: Also called A-frame ladders, these self-supporting ladders usually have wider rungs (for greater stability) and fold together for easy storage. Step ladders should never be used as a single ladder or in a partially closed position. When fully extended open and locked securely into place, they are useful for reaching items in storage, and for routine indoor tasks like hanging pictures. Extension Ladders: Also called a telescope ladder, an extension ladder consists of two or more segments that can be extended out to reach many feet into the air. These ladders are not self-supported and must be leaned against walls or trees for stability. Extension ladders are necessary for tasks high off the ground like painting the sides of your house or cleaning rain gutters. 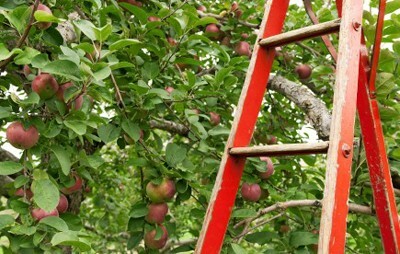 Orchard Ladders: An orchard ladder is designed specifically for picking fruit. There are two styles, straight and tripod, both of which typically get narrower at the top. A straight orchard ladder has just two legs, and is designed to be leaned against a supporting branch. A tripod orchard ladder is three-legged step ladder, with the third leg designed to extend out in front of the ladder for extra support. Unlike some garden tools, ladders may only be taken out of storage one or two times per year so it's important to take a minute or two to inspect them before use. Check the rungs for damage, and make sure they are free of oil, grease, or any substances that could cause you to slip. Look for loose, missing, or protruding screws and rivets, weak or broken rungs, and inspect the ladder for cracks, bent rails, and broken braces. Always start by reading and following all use labels marked on the ladder. They will provide you with information on the proper set-up, use, and restrictions that apply to your particular model. If possible, never perform tasks requiring an extension ladder alone. Have someone near that can steady the ladder and come to your aid should you get into trouble. Never carry a ladder upright when moving it from place to place. Carry it parallel to the ground by placing the center of the ladder over your shoulder, with the front end slightly elevated. If you're going to be working in an area where there is a lot of foot traffic, make sure you erect some type of sign or barrier to alert others of your activities. Never place you ladder in front of an unlocked or unattended door. Always check for overhead interference (power lines, branches, etc.) before raising or extending a ladder. Avoid using metal ladders near power lines, and keep ALL types of ladders away from potentially live wires. Keep firm footing on ladder rungs by wearing shoes with a good grip and non-slip soles. When climbing up and down, always face your body toward the ladder. Keep your hips centered between the uprights with both feet firmly on the rungs. Shift your weight to the balls of your feet so you can react quickly if you need to. If you are climbing from a ladder onto another surface (like a roof), make sure the ladder extends 2-3 rungs beyond that surface so you have something to hang on to. Never stand on or climb higher than the top two rungs on a step ladder, or the top three rungs of an extension ladder. Most falls happen when people try to extend their reach outside of a safe working area. Instead of turning your body or leaning to the side, climb down and reposition the ladder so your work area remains within easy reach. Don't haul tools up a ladder unless you have a safe place for them once you reach the top. Never exceed your ladder's maximum load rating (person + tools).